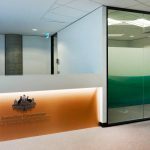 IA Design were engaged to refurbish Australia’s national workplace relations tribunal, the Fair Work Commission (FWC) in the Sydney CBD. The refurbishment occupied 8 floors, housing both the FWC and the Federal Circuit Court of Australia. The brief called for an overhaul of the existing 1980s workspace to create a contemporary space that balanced the needs of the occupying judges, staff and the public. A key intention behind the refurbishment was to facilitate the modernisation of the FWC’s operations – moving from a traditional library-based system to a digitally coordinated system. To enable this transformation, the IA Design team undertook a detailed design, documentation and risk management process to address issues around space optimisation, acoustical design and security considerations. The IA Design team increased the number of hearing rooms to meet FWC’s growing demand and new benchmarks were achieved in space utilisation through design. The FWC building is now compliant with DDA and Commonwealth security requisites. A successful end result that has transformed the operations of the FWC and improved the amenities available for staff and public traffic.